As Brooklyn Nine-Nine builds out its ensemble in the back half of its first season, Terry seems like a great place for the show to start. Over the course of the season so far, we’ve seen the show build what was essentially a physical gag (giant Terry Crews being terrified of a mannequin and firing at it repeatedly, or more broadly, tough guy with a sensitive side) into an actual character arc, as Terry learned to overcome his fear and get back in the field. “The Ebony Falcon” is the first time we’ve seen Peralta actually involved in Terry’s story, and by making him the focus of the episode more than the man who gives the title its name, the show missteps. 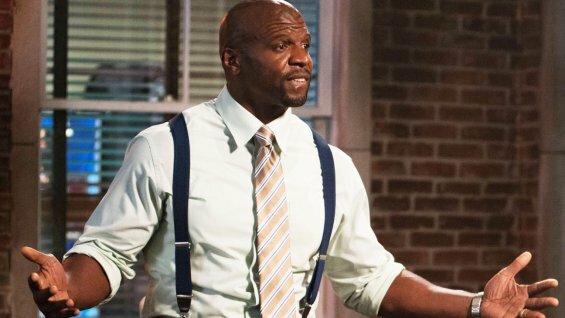 Terry is one of the more comedically diverse characters in the ensemble at this point, largely because Terry Crews is best served by turning on a dime from terrifying rage to hilarious vulnerability. Crews is a big, broad performer, and Terry’s emotional highs and lows allow for him to channel those talents. But “The Ebony Falcon” is not a Terry story, even as it seems like it on the surface and even as it should be. It’s another in a long line of Peralta stories that tend to have one format and play it out ad nauseum. Peralta is excited to get Sergeant Jeffords back in the field and back in his corner, until he meets Terry’s kids and freaks out about keeping their father safe. He makes the mistake of not trusting one of his coworkers and trying to solve their problems on his own, but then he learns that this was wrong, and that he should rely on his friends more. It isn’t rare for a sitcom in its early going to play out the same basic plot structure and emotional beats again and again while it builds out the world of the show, but “The Ebony Falcon” flattens out Terry’s interesting mix of contradictions and reduces Boyle and Holt to their least interesting formulations to give us a story about Jake we’ve seen before, with neither enough nuance or enough laughs to make the retread worthwhile. The subplot, in which Gina’s apartment is burglarized and Holt puts Diaz and Santiago on the case, is precisely the opposite of the main plot, and indicates just how much this show has improved so far in this season. We learn a lot about Gina by watching her when she is at her most vulnerable, and even though the structure (Diaz and Santiago are annoyed and ignoring her feelings, Holt points out they should treat her better and be more empathetic, everyone is closer by episode’s end) is pretty much identical to this week’s A-plot, it works much better because it is deepening the characters and playing with our expectations. And also because it lets Chelsea Peretti be her wonderful brand of very weird. “The Ebony Falcon” is a definite step down after “The Bet,” but even so, it is a reminder that Brooklyn Nine-Nine is steadily improving, figuring out its characters and the ways they interact with one another. We’ve seen evidence the show is solving it’s Peralta problem. Now we just need a bit more hope that it is capable of breaking out of its basic format to deliver different takes on the way Peralta engages with the world. He’s got a clear arc at this point. The show just needs to decide to move him past that arc’s very first step.